If I’m very hungry after shopping at Valley Fair, I usually go to Boudin! Boudin is best known for their sourdough bread, and is based in San Francisco. The original restaurant is at Fisherman’s Wharf. I have yet to go there; it’s usually packed with tourists. I got the sourdough bread bowl with clam chowder after shopping at Uniqlo. Sourdough is a bit tangy; some people either like it or hate it. I love it; my parents aren’t that fond of it. Throughout the United States, “New England-style” clam chowder is often characterized as being thicker and more creamy, even though traditionally it is rather thin (with many late 19th and early 20th century recipes using condensed milk as the base). 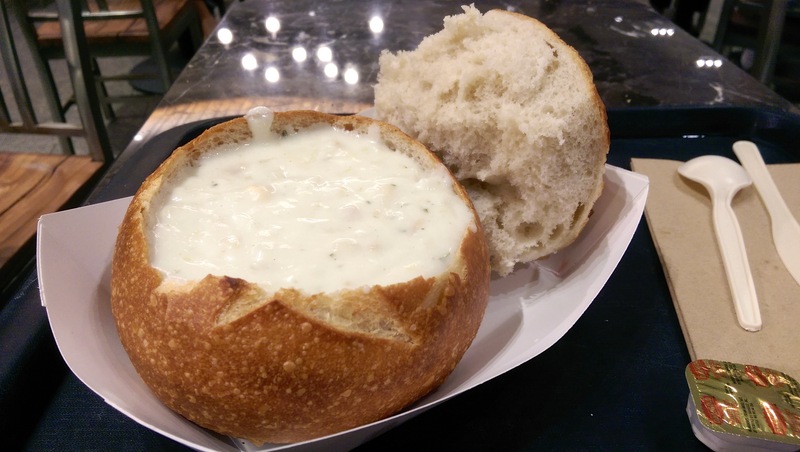 This is sometimes served in sourdough bread bowls, especially in San Francisco, where sourdough bread is popular with tourists and has been considered a signature dish since 1849. I always feel like it’s NOT enough soup!!! I wish there was more!!! yeah!! same here. i always have so much bread left over… the leftover bread is sitting in my fridge, a week later….